I don’t know about you but this era of extreme political correctness is really wearing on me. One of my latest retreat notes said, “Satan hides behind politically correct words like diversity, pluralism, choice . . .” Isn’t that the truth? I’d add words like tolerance to the list. People who preach the mantra of tolerance seem to be the most intolerant people themselves. If you don’t agree with them they attack you and if that’s not intolerance I don’t know what is. How about this word to describe them: hypocritical. Another word I’d add to the list is sustainability. I work in agricultural communications and this has to be one of the most overused and misunderstood words in our vocabulary, along with organic and natural. What does sustainability mean? Ask 10 people (including so called experts) and they’ll give you 10 different answers. It’s a hide behind word for people with a political agenda for the most part. Guess who’s hiding behind it? Answer is found above. Sadly, these words are not bad in and of themselves but in how they’re being used in our mainstream media and by politicians, lobbyists and people who want to attack Christian values. So, what can be done about it? For starters let’s use these words in a context that’s defined by our religion and faith. Let’s not lash out in anger at those who are misusing them for their own ends but pray for them instead. Do you have any other suggestions? Feel free to comment. As soon as he reflected seriously and was struck by the conviction that immortality and God exist, he naturally said at once to himself: “I want to live for immortality, and I reject any halfway compromise.” In just the same way, if he had decided that immortality and God do not exist, he would immediately have joined the atheists and socialists (for socialism is not only the labor question or the question of the so-called fourth estate, but first of all the question of atheism, the question of the modern embodiment of atheism, the question of the Tower of Babel (Genesis 11:1-9) built precisely without God, not to go from earth to heaven but to bring heaven down to earth). We hear so much about the need to feed the hungry around the world. But how is that being done? Can it be done? One of the things that will help is increasing the productivity of people who can produce food. That would be farmers. Biotechnology is helping them accomplish this. But like just about everything today it seems, there are people who want to protest it. I think most of them just don’t like big companies. They just use this as an excuse to promote their own personal agenda. Genetically modified crops are very safe and the amount of research that goes into the creation of what is essentially just speeding up a natural process is extensive. There’s never been a negative problem with a GMO. So, why the Pope’s picture? It’s really because of the action of the Pontifical Academy of Sciences and a letter from a Minnesota farmer. Thanks to Terry Wanzek who grows corn, soybeans, and wheat on his family farm in North Dakota and serves as a North Dakota Senator and board member of Truth About Trade & Technology, for bringing this to my attention. The Pontifical Academy of Sciences, founded by Pius XI of hallowed memory, is placed under the exalted and direct protection of the reigning Supreme Pontiff. The aim of the Pontifical Academy of Sciences is to promote the progress of the mathematical, physical and natural sciences and the study of epistemological problems related thereto. There are some people around the world who think religion and science shouldn’t get along. For some reason, they believe the men of the cloth should disagree with the men of the lab coat, now and forever. This is a welcome marriage of religion and science–two powerful forces joining for the good of all. Farming is my profession. But it’s more than a job–it’s a vocation. 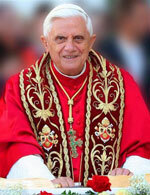 The Catholic Church teaches us to show benevolence toward the poor, and to feed them when they are hungry. One of the best ways I can realize this goal is to grow as much food as possible and to make it available at the most reasonable prices. I believe it is important that all farmers, especially the resource-poor smallholders, have the right to choose the best technology available, including biotechnology when appropriate, to improve their hope of producing more food for themselves. Isn’t it great when science and religion can agree and even in the face of extreme emotionalism with a political agenda. Your slacker blogmaster really needs to get with it here and with election day today I just had to get back on track. It’s an important day in America and I hope everyone will exercise their civic and moral duty. I attended a Sarah Palin rally here in Missouri yesterday and it was a lot of fun. Estimates are 18,000 at the State Capitol. You can see more pics here. You’ll get the distinct impression from this post that I support voting McCain-Palin. You are correct. I see this as a very clear choice. Unfortunately, I have some very liberal friends who I believe have convinced themselves so much that they hate our current President that they’ll vote for anyone without seriously thinking it through. They argue that there’s really not much one man can do so why worry? But then why are they so angry at President Bush? I know. It doesn’t make sense and it’s all based on emotion and not thoughtful and prayerful consideration. We need to move our country back toward the kind of faith filled values that started it. Our country’s founders weren’t liberal anarchists. 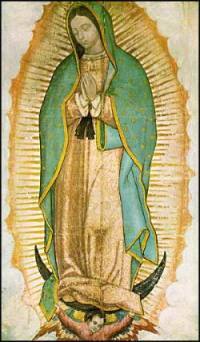 They very carefully and prayerfully considered what they were doing and acted accordingly. I thank God they did. You should know how pro-life Chelsea and I are and I believe that’s enough reason to vote for McCain-Palin. However, there are so many more. I’m a small businessman and there’s no way I could support the policies of the O-man. We’re looking at a socialist who could have full Congressional support. That should be pause for anyone who wants to have a job and opportunities in the future. Oh and btw. Hank Jr. sang a variation of one of his hits, called “McCain-Palin Tradition.” I think you will enjoy it. Though not an Opus Dei cooperater himself, Sam Brownback, a lifelong Protestant, was welcomed into the Catholic Church four years ago by Fr. John McCloskey, a priest of the prelature. Three cheers for the Supreme Court’s ruling to uphold the partial birth abortion ban. This is a barbaric procedure which destroys the dignity of human life and our children, our women, deserve better. I’m sure I don’t need to remind you to vote today but I am anyway? I’ve decided not to listen to any more of the rhetoric. I’ll read about it in the news tomorrow. But that doesn’t mean I don’t care. I’ve done my duty and registered my vote. Now it’s up to the rest of the country to stand up and be counted. Does your one puny little vote count? You bet it does. What do you think makes up that big number at the end of the day? So, no matter what side you’re on please get out and add your vote. As I heard someone say yesterday, we have the freedom to do this at the cost of many, many lives and they should not be forgotten. I also think our vote is a way to honor those who are still in harm’s way defending our right to do this. 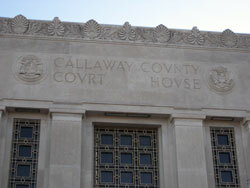 I have to be out of town next Tuesday so it was off to the Callaway County Courthouse today to vote by absentee ballot. I know the election isn’t until next Tuesday but I urge you to use this right and make your voice heard. We really need to see the proposed Amendment 2 here in Missouri defeated in a big way. At the University of Missouri football game yesterday a plane flew around the stadium pulling this sign. Let’s keep getting the message out about the truth of this boondoggle and get it defeated next week. If you need any information please let me know and I’ll be happy to send or point you to it. 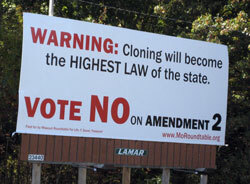 In Missouri it looks like we’ve got a number of big names weighing in on the Amendment 2 ballot initiative that would allow human cloning and the destruction of human embryos. I haven’t seen this ad on tv yet but it’s on YouTube and got mentioned in USA Today, although I couldn’t find it in their online edition. Let’s just hope people will look beyond the emotionalism and see the truth. Vote No on this please. This would be the good. The people with common sense who are having to spend their hard earned money stopping this horrendous state constitutional amendment 2 that would allow human cloning even though the people behind it claim otherwise. Don’t be fooled people. The enemies of life are clever. This would be the bad and the ugly all wrapped into one. Their billboards show a baby as if what they’re proposing would be good for them. Unfortunately they just want to create babies so they can kill them and harvest their parts. Not something I’m particularly fond of. No, we don’t need or want embryonic stem cell research in this state or anywhere else. Somehow the people of Missouri have allowed themselves to be suckered in by an emotional pitch for a pack of lies. The result is a state constitutional amendment that would not only allow human cloning but prevent any law from restricting research on human embryos. It’s kind of hard to believe that people can be this cruel but then look at abortion in this country. This is all about money and one family in Kansas City who has already spent almost 16 million dollars promoting this phony amendement 2 problem. So, if you really want to know the facts about what’s going on here I suggest you check out Reflections of a Paralytic. Of course I think it’s great. It’s my daughter’s new website. I’ll let you learn her story by visiting her website and looking at the growing amount of resources she’s linking to on the prolife issue and especially this cloning proposal we have facing us. BTW. That’s her wheelchair in the picture. I can’t say how proud I am of her and what she’s doing. It’s very well done. In fact, look at what was just written about her on Kansas City Catholic. Her website already has more traffic and visitors than this one! Things are sure heating up here in Missouri this election year. We’ve got a supposedly tight race for Senator with incumbent, Senator Jim Talent who has to run against this lady. I think we need to pray for both of them. Jim’s a good prolife legislator who I know personally and think highly of. Claire, well, let’s just pray for her. Unfortunately Claire, who is supposed to be Catholic and a member of my parish here in Jefferson City, MO is very pro-death. I don’t know how people like that resolve that conflict in their minds. It’s sad really. Really behind on posting again. I’m going to figure out a way to change this since I’ve been trying to blog here like I do on my professional sites. So here’s the new idea. I’ll post daily and they’ll be short, but still include links to timely items of interest (hopefully). 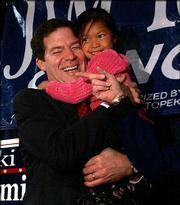 For example, I’ve been wanting to write about the current situation with our MO Senator, Jim Talent. He’s always been so very outspoken about his prolife beliefs and until just recently has exhibited that in his offices. However, he just removed his name as a co-sponsor of a Senate bill to ban cloning. His reasons are not good and I don’t see how he can spin his way out of this one. I believe he even mentioned the need to “compromise.” There’s never a need to compromise about life in my opinion. I’m highly disappointed in him and the next thing I’m going to do when I finish here is write him a letter to let him know how I feel. I hope you will too.